More great things are happening at The Plaza! Not only are we celebrating a New Year, we’re also rejoicing about our brand spanking new meeting space. That’s right – the construction of the Walnut Room is complete! So let’s meet. The Walnut Room is located off of The Café dining room and is a perfect space to mix and mingle. 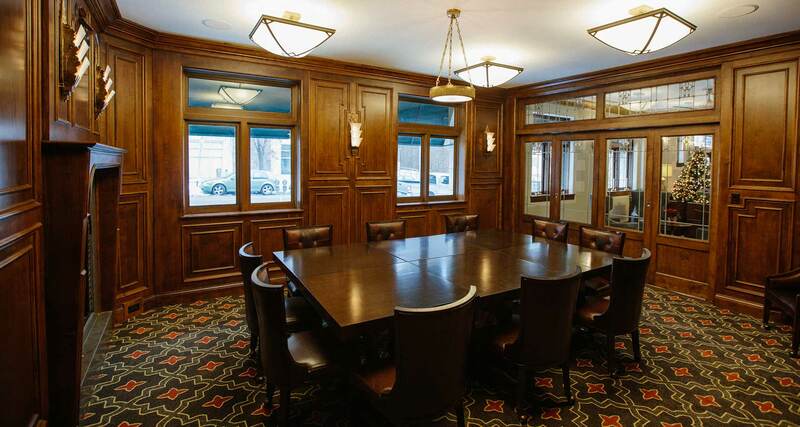 This sophisticated space features handsome wood paneling, signature historic touches, a wet-bar and a cozy fire place. With seating up to 12, we look forward to hosting events such as business luncheons, bridal showers and other unique gatherings. And when that tummy starts to growl during your event, don’t fret! The Café at the Plaza is here to provide delicious catering for your event. Chef Matt is happy to offer a variety of catering items for your group – offering everything from light appetizers to a full sit-down experience. And as always, we are proud to support Milwaukee vendors and stock our kitchen with as much good as we can. Learn more about gathering at The Plaza and help us celebrate a new year and event space.